Translate English to French is something that you have likely been searching for today. During those searches, you may have seen that there are numerous ways in which translations are performed. However, the quality of translation you expect to receive must be balanced with the cost of the translation. One way is obviously by using a language translator. But for some people or companies on a lower budget, the prices may seem too great. However, the thought of using Google Translate or other free translation tools is something that you may also be wary of from a quality standpoint. Are there any solutions to these problems? As aforementioned, many can be wary of using free tools such as Google Translate – and they would be right to do so. 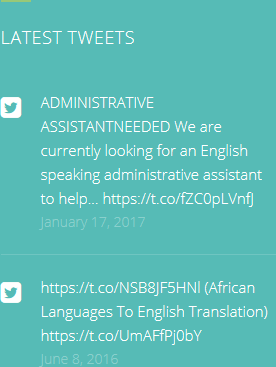 While this software is perfect if you just want to casually translate a forum post or some sort of social media post for purely personal reasons, they just can't stand up to a human language translator. This is because Google Translate and the like will try to give you the best word-for-word direct translation. However, it will not consider contextual and cultural methodologies. For example, if you are an English student in France and studying in French, you may find it preferable to write your academic papers out in English. Many students do this when studying in a foreign country. It may seem easy to then just run the document through a free translator and use the results. However, if you're not a native speaker of French, can you be sure that Google Translate hasn't just included a cultural insult to the marker of your essay? These tools don't know whether they have given an insult because it is a machine with very limited intelligence. For example, if you write 'you stink' in English, it will give you the French for 'you stink'. The machine doesn't have a moral or ethical code, or an understanding of cultural intolerances – it's purely performing a literal translation of English to French. This is why if you're looking to translate English to French online, you should look for a human translator French English. Despite the issues that they can encounter, many people still go ahead and use such free tools. Sometimes they can get away with it; most times, they lose business and essay marks. There is just no equal to proper human translations from English to French. Just look at HSBC bank in 2009. The multinational was forced into launching a $10 million campaign to rebrand after its previous campaign with the catchphrase “Assume Nothing” was translated in various countries as “Do Nothing” – a costly mistake. Translation has even caused markets to tumble. In 2005, the world's foreign exchange market went into full panic mode – leading to the U.S. dollar plunging in value – after a poorly translated article from the China News Service circulated around the internet. By now, you can probably see why using a literal word for word translator English to French via a machine can be a bad idea. However, you still have your original problem: the cost of a human to translate English to French is just too much for your budget. So, is there a cheaper alternative out there? Thankfully, there is. Some quality translation services will use a machine to translate your piece from English to French, but a human will then work with the translated piece to ensure that it is readable in French. This is called 'Post-editing Machine Translation' (PEMT), and it's something that is offered at HQ-Translators. By now, you should be able to see how important it is to have a human language translator involved in any translation of some importance. With HQ-Translators PEMT services, you can make this process affordable. While the best translations are offered by our human translators, a Post-Editing Machine Translation is a good way to get a cheap, readable and accurate translation of your text. So, whether you are looking to translate English to French, or otherwise, contact HQ-Translators today. 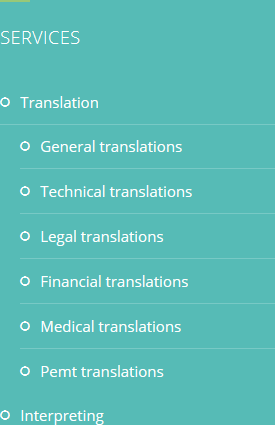 Our team of skilled translators convert financial, legal, medical and various technical documents into over 30 different languages every day. 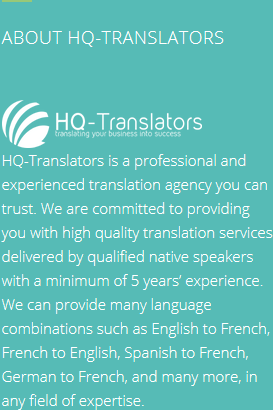 To find out more, just visit us at https://hq-translators.com, give us a call on (00 237) 242 71 38 38, or email infos@hq-translators.com.